The trouble in Europe seems to be getting worse, with debt fears spreading somewhat beyond even Spain to Belgium and Italy. This is something people need to keep in mind when they think about QE2 and the fact that the real problem with current monetary policy is that it’s not loose enough. One thing you’re seeing as all this plays out in Europe is that the Euro is declining in value relative to the dollar. The dollar could go up for two kinds of reasons. One would be that foreigners are increasing their demand for US-made goods and services. They could be saying “I don’t want these Italian financial assets, I’m going to go buy a Boeing jet.” But obviously that’s not what’s happening here. Instead people are concerned about the increasingly rickety-looking European monetary system and want to get their hands on dollars as such. The right response to this is for the Fed to be doing monetary stimulus—printing more money. This can take a number of forms. Buying longer-dated Treasuries seems to be what the FOMC is most comfortable with, but in a lot of ways I think it would be better to just create the money and send it to people. There are some questions about exactly how you would organize such a “helicopter drop” but I’m confident it could be worked out. And working those problems out would, among other things, have the advantage of improving the politics of monetary stimulus. Cut the banks out of the transmission mechanism and illustrate the fact that the point is to increase the amount of money that people have. And Milton Friedman was wrong: in the face of a really big shock, which pushes the economy into a liquidity trap, the central bank can’t prevent a depression. In the Samuelsonian synthesis, one must count on the government to ensure more or less full employment; only once that can be taken as given do the usual virtues of free markets come to the fore. In the end, then, the era of the Samuelsonian synthesis was, I fear, doomed to come to a nasty end. And the result is the wreckage we see all around us. Fish don’t feel the water they swim in. (I’ve heard that’s false, but it’s too good to check). Paul Krugman does not feel the Monetarist hegemony he swims in. Não reconhece, ligado ao assunto da coluna, que em 2000 Friedman havia “cantado a bola” para os problemas que hoje afligem a Espanha, Irlanda, etc. Na verdade, a “síntese Samuelsoniana” teve seu fim no final dos anos 1960, exatamente no momento em que “brilhou” a “paixão Friedmanita”. 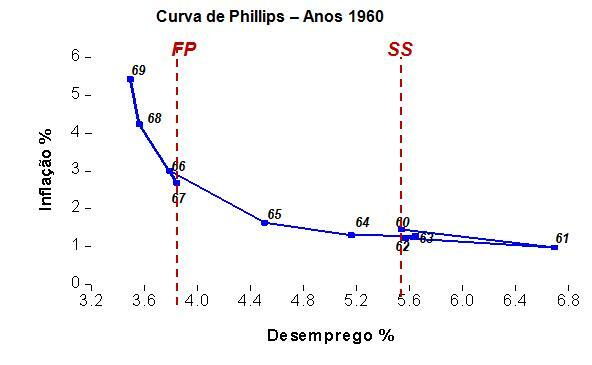 Em 1960, Samuelson e Solow (SS) “venderam” o instrumental da Curva de Phillips para os Conselheiros Econômicos do Presidente Kennedy. A CP servia como o “menu de escolhas” – fixo ou estável – entre inflação e desemprego à disposição das autoridades econômicas. Em 1967, Friedman e Phelps argumentaram que a “Curva” não era “fixa ou estável”, e que a escolha de uma inflação mais elevada para se obter uma taxa de desemprego mais baixa não se sustentaria. Ao final, a taxa de desemprego não cairia e a inflação seria maior. Ou seja, a Curva se deslocava no tempo. As figuras mostram que a “conjectura” de FP estava correta. 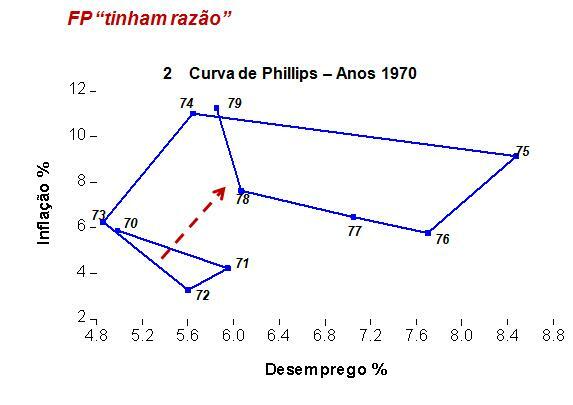 Nos anos 1970, as expectativas de inflação se ajustaram e a Curva “deslocou-se”. Milton Friedman in 1970′s believed that M2 growth ought to be kept small and constant – the k% rule. Milton Friedman lost that battle. But he won every other battle. He won the war. No fundo no fundo Krugman sabe disso! E olha que eu tenho dúvida se “aquela batalha” foi realmente perdida. A “Grande Moderação” iniciada em meados dos anos 1980 foi (para mim) consequência de uma adaptação da “regra”. Michael Bordo: Do you think the recent introduction of the euro will lead to the formation of other common-currency areas? Milton Friedman: That’s an extremely interesting question. I think that the euro is one of the few really new things we’ve had in the world in recent years. Never in history, to my knowledge, has there been a similar case in which you have a single central bank controlling politically independent countries. The gold standard was one in which individual countries adhered to a particular commodity—gold—and they were always free to break or to leave it, or to change the rate. Under the euro, that possibility is not there. For a country to break, it really has to break. It has to introduce a brand new currency of its own. I think the euro is in its honeymoon phase. I hope it succeeds, but I have very low expectations for it. I think that differences are going to accumulate among the various countries and that non-synchronous shocks are going to affect them. Right now, Ireland is a very different state; it needs a very different monetary policy from that of Spain or Italy. On purely theoretical grounds, it’s hard to believe that it’s going to be a stable system for a long time. On the other hand, new things happen and new developments arise. The one additional factor that has come out that leads me to raise a question about this is the evidence that a single currency—currency unification— tends to very sharply increase the trade among the various political units. If international trade goes up enough, it may reduce some of the harm that comes from the inability of individual countries to adjust to asynchronous shocks. But that’s just a potential scenario. You know, the various countries in the euro are not a natural currency trading group. They are not a currency area. There is very little mobility of people among the countries. They have extensive controls and regulations and rules, and so they need some kind of an adjustment mechanism to adjust to asynchronous shocks—and the floating exchange rate gave them one. They have no mechanism now. If we look back at recent history, they’ve tried in the past to have rigid exchange rates, and each time it has broken down. 1992, 1993, you had the crises. Before that, Europe had the snake, and then it broke down into something else. So the verdict isn’t in on the euro. It’s only a year old. Give it time to develop its troubles. Milton Friedman: Yes, indeed. As far as Japan is concerned, the situation is very clear. And it’s a good example. I’m glad you brought it up, because it shows how unreliable interest rates can be as an indicator of appropriate monetary policy. The Japanese bank has supposedly had, until very recently, a zero interest rate policy. Yet that zero interest rate policy was evidence of an extremely tight monetary policy. Essentially, you had deflation. The real interest rate was positive; it was not negative. What you needed in Japan was more liquidity. During the 1970s, you had the bubble period. Monetary growth was very high. 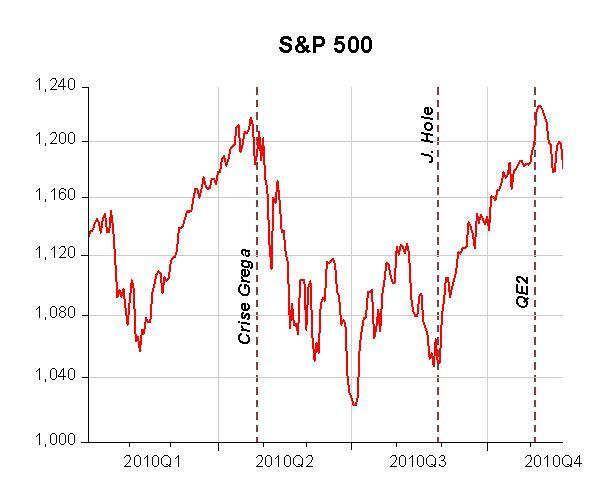 There was a so-called speculative bubble in the stock market. It’s very simple. They can buy long-term government securities, and they can keep buying them and providing high-powered money until the highpowered money starts getting the economy in an expansion. What Japan needs is a more expansive domestic monetary policy. Pena que Friedman morreu e não está aí para “botar a boca no trombone”. Ele teria “carisma” para mudar o curso dos acontecimentos! Ninguém pode dizer que um grupo reunindo os governos Chinês e Alemão (representantes de uma longa lista), deputados Republicanos, o economista prêmio Nobel e Liberal Joseph Stiglitz e Sarah Palin possa ser definido como “homogêneo”. The day before his party’s shellacking in this month’s elections, President Obama sat down with his economic team to examine the single most important issue for voters across the country: jobs. But the question on the agenda was not how to accelerate the recovery or target job creation to the depressed Rust Belt. It wasn’t even the challenge of how to persuade corporations to spend their cash piles on investments and jobs — although both have been extensively debated for many months. The president had called the meeting to grapple with what he and his propeller-head economists have been debating for some time: the wonkish question of whether today’s high unemployment rate is structural or cyclical. But, of course, my priors lean to the view that neither fiscal nor monetary expansion will do much good”. O próprio Bernanke, talvez em função das divergências no seio do FOMC, não agiu com “paixão”, preferindo dar um “bitoquinha” de U$ 600 bi ao invés de “agarrar a moça” e prometer que fará de tudo ao seu alcance para que “ela seja feliz”! Não é surpresa, portanto, ver que o QE2 “fraqueja”. Sabemos que para que a “felicidade” seja alcançada, as expectativas de inflação (ou que o dispêndio nominal esperado) tem que subir significativamente. A figura abaixo mostra que isso não está acontecendo. O “fogo” durou pouco, “brilhando” após o Fed começar a discutir a possibilidade de conceder estímulos monetários na reunião de Jackson Hole no final de agosto, mas perdendo força com o crescimento das manifestações contrárias. O comportamento da bolsa também parece refletir a ausência de “paixão”! Fish don’t feel the water they swim in. (I’ve heard that’s false, but it’s too good to check). Paul Krugman does not feel the Monetarist hegemony he swims in. The only part of Monetarism that he does feel, and that he now identifies with Monetarism, is that one small part of Monetarism that failed to achieve hegemonic status. Milton Friedman in 1970’s believed that M2 growth ought to be kept small and constant – the k% rule. Milton Friedman lost that battle. But he won every other battle. He won the war. Argumento “bisonho” para mais aperto monetário! Fed chairman Ben Bernanke concedes that, while necessary, a new large purchase of government bonds by the Fed to help cover the deficit will not completely solve our problem of slow growth. Many in the markets and around the world express the same sentiment in a more negative way—saying this latest round of “quantitative easing” won’t work. Only time will tell, and our best guess is that, because it is only modestly effective by itself, quantitative easing will probably be part of Fed policy for quite some time. One reason we must hope that quantitative easing is not too successful is that its near term success would mean a catastrophe for government finances. A única coisa que Lindsey diz que faz sentido é que uma recuperação econômica vai elevar os juros. 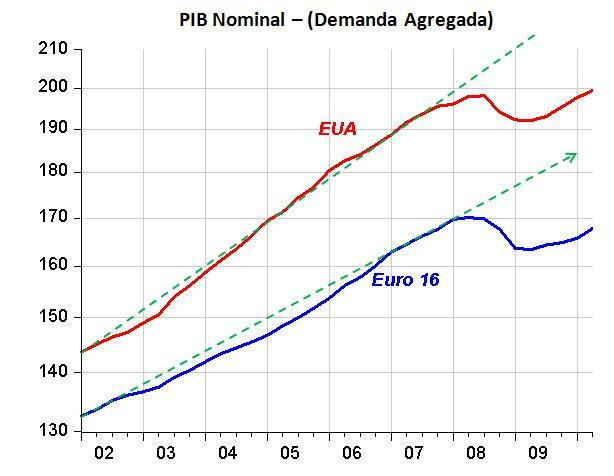 Na verdade, juros em alta seria um sinal seguro de que a economia está se recuperando. De resto, sua preocupação com uma crise fiscal é despropositada. Em primeiro lugar, deve-se lembrar que a expansão do déficit público foi, em grande parte, o resultado da adoção de uma política monetária apertada (lembrem-se que ao final de 2008 quando trouxe a taxa FF a “zero”, o Fed disse que a PM já fazia tudo o que era possível e que havia a necessidade de “ajuda fiscal”, que veio na forma do ARRA!). Lindsey não percebe que é muito mais fácil lidar com problemas fiscais numa economia em crescimento (por causa do QE) do que numa economia “estagnada”. Também não considera que manter a PM “apertada” (sem QE) criaria outros problemas ignorados pela sua análise, como pressões adicionais pró protecionismo. E, lógico, uma PM “apertada” aumentaria as chances de maior déficit fiscal e problemas fiscais. Ou seja, seus argumentos não “fecham”. Sinal dos tempos que nos dias atuais “vale tudo”! Nick Rowe (aqui) discute não se o euro pode ser salvo, mas se a União Européia consegue sobreviver! Just for once, this is not a question best left to the Poli Sci. Because the main forces will be money/macro. For nearly two years now, I’ve been worried that one or more of the Eurozone countries might do an Argentina. I’ve been asking whether the Eurozone could survive. I think it’s time to change the question. Can the EU survive? I don’t know the answer. But I think there’s a serious risk that it won’t. And I think the EU would have a better chance of surviving if the Eurozone were killed off quickly. Como já ilustrei em diversos posts, (aqui, por ex.) o principal problema por trás da “Grande Recessão” foi a queda aguda do dispêndio nominal. 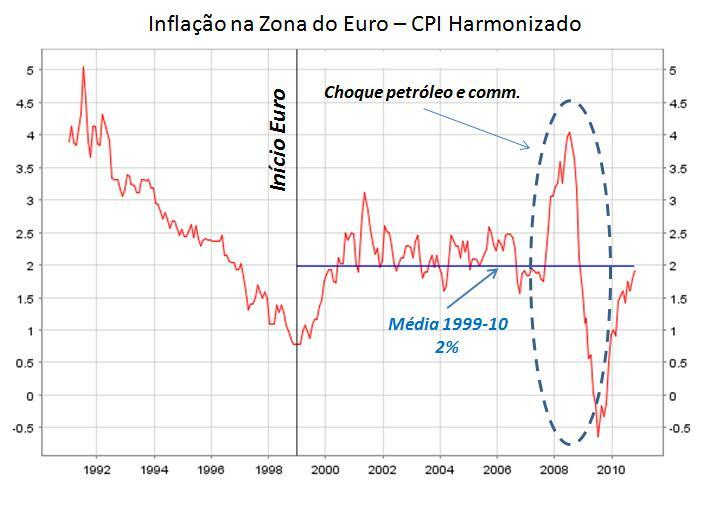 O mesmo fenômeno pode ser observado para a Zona do Euro. A principal razão para isso foi a PM contracionista diante da elevação da inflação por conta do choque de preços (petróleo e commodities), no quadro de um ambiente fragilizado pelos problemas financeiros. Mais uma ilustração do argumento contrário ao regime de metas para a inflação quando esta já foi “conquistada”. Isso porque choques de oferta (ou de preços) são desestabilizadores se o regime é o de meta para a inflação. Melhor seria, mais uma vez, ter “meta” para o nível da DA. One disturbing thing about studying economic history is how things that happen in the present change the past – or at least our understanding of the past. For decades, I have confidently taught my students about the rise of governments that take on responsibility for the state of the economy. But the political reaction to the Great Recession has changed the way we should think about this issue. Today, the flow of economy-wide spending is low. Thus, US Federal Reserve Chairman Ben Bernanke is moving to have the Fed boost that flow by changing the mix of privately held assets as it buys government bonds that pay interest in exchange for cash that does not. That is entirely standard. The only slight difference is that the Fed is buying seven-year Treasury notes rather than three-month Treasury bills. It has no choice: the seven-year notes are the shortest-duration Treasury bonds that now pay interest. The Fed cannot reduce short-term interest rates below zero, so it is attempting via this policy of “quantitative easing” to reduce longer-term interest rates. Barro: My conclusion is that QE2 may be a short-term expansionary force, thereby lessening concerns about deflation. However, the Treasury can produce identical effects by changing the maturity structure of its outstanding debts. The downside of QE2 is that it intensifies the problems of an exit strategy aimed at avoiding the inflationary consequences of the Fed’s vast monetary expansion. Krugman: But I really don’t understand this. Granted that QE2 will probably have some positive effect, hopefully bigger than analysis based on the debt-maturity equivalence suggests. Still, the prospect remains that we’ll face multiple years of high unemployment — or, if you prefer, a protracted large output gap (PLOG). And history is clear on what that means: declining inflation. 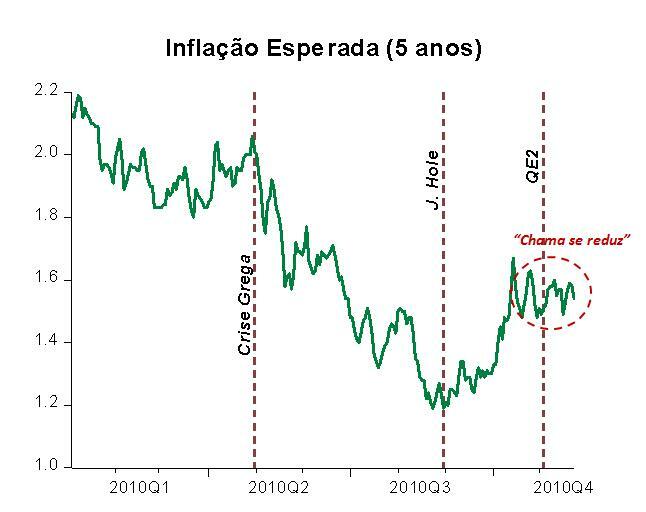 Update: Krugman elebora sobre o artigo de DeLong (aqui).